SQM's Best Practice Awards acknowledge organizations that have demonstrated best practices that have improved or helped maintain high first call resolution, customer satisfaction, and employee satisfaction performance. Both SQM clients and non-SQM clients submitted stories for our 2015 Contact Center Best Practice Awards. ►Accenture Business Services for Utilities Inc.
SQM would like to congratulate all our Contact Center Best Practice Award winners! These award winning organizations will be featured as speakers at SQM’s 17th Annual One Contact Resolution Conference. SQM is pleased to arrange press interviews with the executive contacts within our prestigious winning organizations. Please contact us at SQM to discuss next steps. 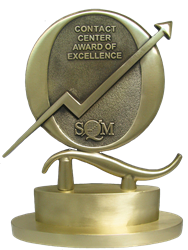 SQM will be presenting the 2015 Contact Center Best Practice Awards at SQM’s annual conference and awards ceremony held in Coeur d’Alene, Idaho, May 17th – 19th, 2016. Service Quality Measurement (SQM) Group is a specialist firm for assisting organizations in using voice of the customer (VoC) research data to measure and improve contact channel customer experience, operating costs and retention. Since 1996, SQM’s customer survey research and best practices consulting services have helped clients improve their contact center first contact resolution (FCR) and one contact resolution (OCR) performance. In fact, SQM enjoys a 95% retention rate with over 70% of our contact center tracking clients improving their contact channel FCR, OCR, and operating costs year over year. For the average contact center SQM benchmarks, a 1% improvement in their FCR performance equals $256,000 in annual operational savings. SQM benchmarks over 500 leading international contact centers on an annual basis in 15 countries around the globe. SQM also benchmarks and tracks all the major contact channels (i.e., website, call center, IVR, email and site). Our site contact channels include branch, retail store, dispatching and service work. By conducting contact center benchmarking and tracking studies on these contact channels, organizations can get insights into customers’ experiences using these contact channels individually or using multiple contact channels, to get their inquiry resolved. For all the contact channel benchmarking and tracking studies, SQM focuses on the customer’s experience in achieving first contact resolution and one contact resolution. SQM annually conducts 1.5 million surveys with customers who have used a contact center, email, website, IVR or site contact channel service.